This is an attractive stone-built L-shaped country pub set on a really tight bend going through the village at the Oakham end. 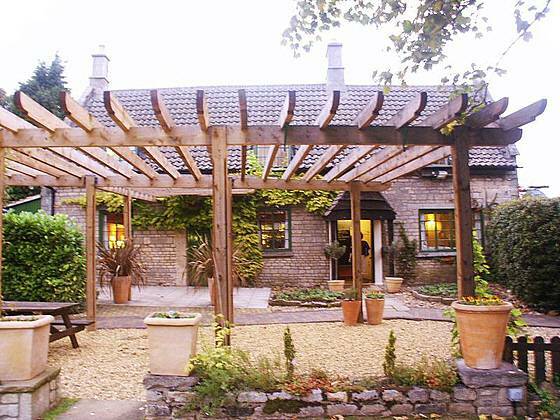 The pub has a nice garden lawn with picnic benches for summer and also a heated patio area, for the British summer. If the weather holds off long enough on summer Saturdays they have barbecues and garden skittles. The Olive Branch was refurbished in 1999 to be more food orientated, though it still serves a good pint of real ale - watch out for neuveau rich blocking the small bar area. Inside it still retains the low beamed ceiling and uneven floors and suffers from a lack of space all round, though there is a nice log fire in the stone inglenook fireplace. To get to the bar you need to negotiate a small access area with tables and chairs that leads round the corner to the bar area. This space has been narrowed by the addition of a settle and table opposite the bar. If anyone stands at the bar to drink, it is not easy to get passed without asking. There are two further areas - non-smoking - are all set out for eating and all tables were reserved for dining - you have to book at least a month in advance to get a table! These rooms are set out well with bric-a-brac of country life adorning the walls. These are sometimes antiques and if you see something you like, as ask behind the bar as much of it is for sale. Here there is space to eat and sit in intimate surroundings. There is another space next to the servery which has old church - individual seat - pews and very low - almost coffee table like - tables. You can eat here and these are often free/not booked, but it can be uncomfortable for some. The beer on at the time were Grainstore Olive Oil and Grainstore Beast. The former is really Cooking re-badged for the pub. Both were well kept, if a little expensive. Sometimes there is a guest beer in addition to these. They also have a wide selection of wines and whiskies. 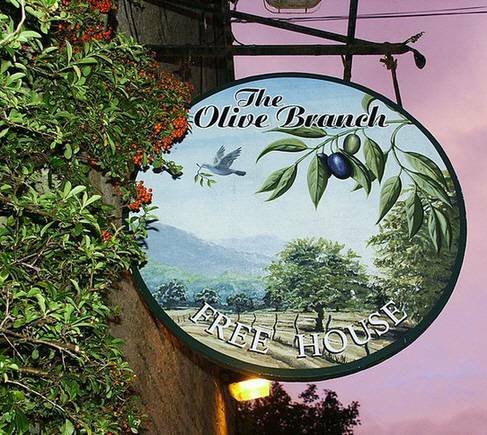 You really come to the Olive Branch for the food and we were not to be disappointed. Using much local produce the menu has some surprises like partridge and steak, though the vegetarian choice was limited, they were prepared to mix and match elements of the other meals to order. They also bring out home-baked bread for you to self slice. The food was more expensive than most pub meals and was served like a restaurant, however, the meals were good and presented more in pub style than posh restaurant. Service was good and attentive and the staff seemed very happy to be there. Note no bar food on Sunday evening. The menu changes frequently, but the choice is not too wide. When we were there they ran out of two options, which restricted choice even further. Other than that and the toilets being on one side of the building and down a draughty corridor, it was a pleasant experience and we would go again - remembering to book well in advance to get a decent table. However, if you are passing or in the area and are in need of refreshment, then this is the place to stop for a drink and packet of crisps. To get here take B668/Stretton exit off A1 N of Stamford; Clipsham signposted East from exit roundabout. No accommodation here and not a lot near by. However, this pub deserves a mention for the food and ale.